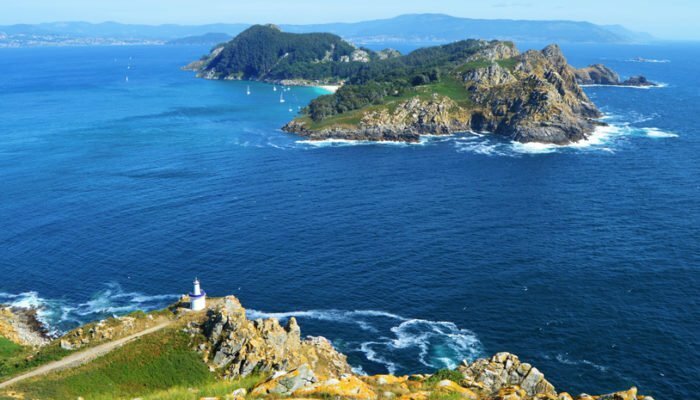 It is an archipelago formed by three islands: Monte Agudo, O Faro and San Martiño; the first two islands are joined by Rodas Beach, classified as “the best beach in the world” in 2007 by The Guardian newspaper. Its paradisiacal sands and crystal clear water, together with a unique flora and fauna, protected seabed, cliffs and dunes, make this place an exceptionally rich Maritime-Terrestrial National Park. With dates planned for the trip, we have to examine the meteorology. In our opinion, the best time of the year to visit them are the months of May, June, September and October. The island is less crowded and can be enjoyed in a more natural and paradisiacal way. In summer (although there are many more people) it is also a magnificent time, since, thanks to the high temperatures, it is possible to enjoy its beaches much more and to take a bath in its crystalline waters, although the temperature, it must be said, usually oscillates between 13-16 degrees. Application for authorisation from the Xunta de Galicia. In recent years, the Cíes Islands have become a coveted destination both nationally and internationally. The places for your visit, being a National Park of the Atlantic Islands, are limited to 2000 people per day. It is therefore very important to apply for permission and buy Ferry tickets. Mar de Ons: Departures from Cangas, Vigo. Baiona on low season. Pirates of Nabia: Departures from Cangas, Vigo and Baiona. Children under 5 always travel free. Between 4/5 (depending on the shipping company) and 12 years pay 6€ in high season. The rest of the time they travel for free. Adults 18,5€ in high season, 16€ in low season. 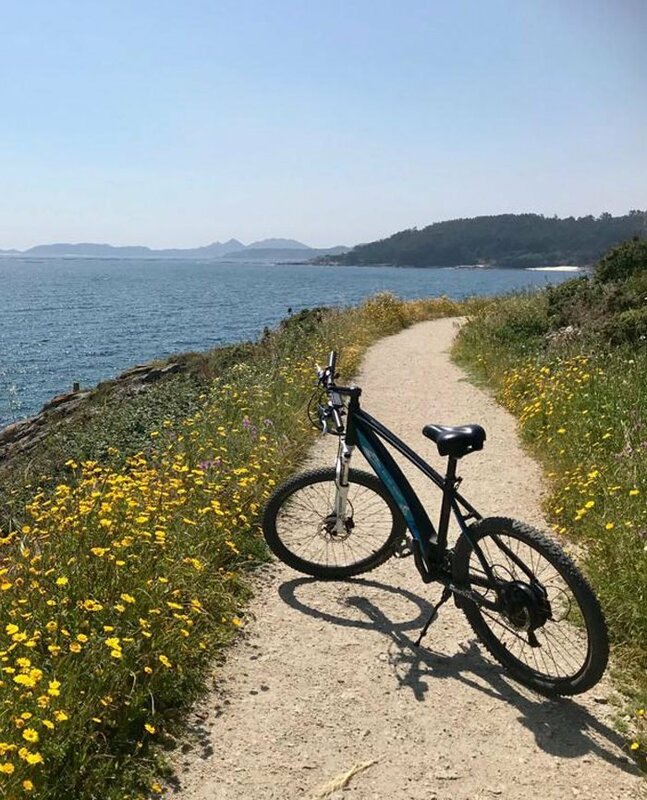 Cangas do Morrazo: It is the European municipality with the greatest number of beaches and in recent years it has become the favourite place to enjoy paradisiacal beaches, activities related to nature and enjoy the tranquillity that other areas of the Rías Baixas do not offer, so crowded in the summer months. 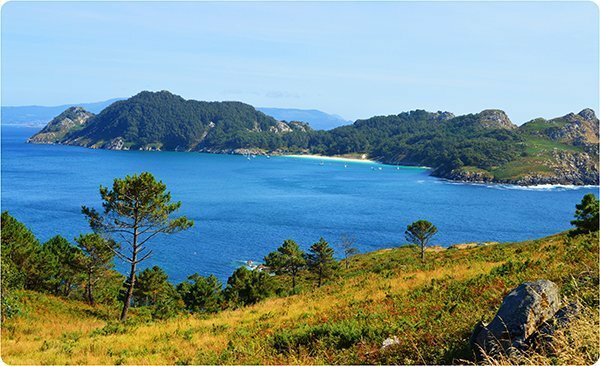 Specifically, the Aldán Estuary, only 10 minutes by car from the Cangas quay, has all the conditions to make your stay unforgettable and surprising in a way that did not imagine the people who know it for the first time. 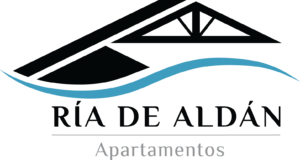 The arrival to Cíes from Ría de Aldán Apartments is very simple: next to the apartments is the bus stop “Cerqueiro” where we will take the transport that in only 15 minutes takes us to Cangas, port in which we will take the main boats to Cíes destination. To return, in the port of Cangas you will be picked up by the same bus that will drop you right in front of the apartments. If the option is to enjoy a more urban nucleus, this city will not leave you indifferent. In recent years it has become, in our opinion, the most beautiful city in Galicia. It allows you to combine your getaway to nature with a modern city. You can book your room with buffet breakfast and a Spa session that will not leave you indifferent. Reservations and www.granhotelnagari.com from 194€/day. You will have no problem locating the exit from Vigo, it is very well indicated. Another option is to go camping in Cíes and enjoy several days on the island. The prices vary, but for example, carrying the person the tent and in summer are € 8.90 per adult and € 6.70 per child from 3 to 10 years + 8.90 per tent. For a couple with a child it would be about 33 € per day. There is also the possibility of using the tents provided by the campsite , at 55€/day for the single (2 people + child) and 85€/day for the double (4 people + child). What to do in the Atlantic Islands? 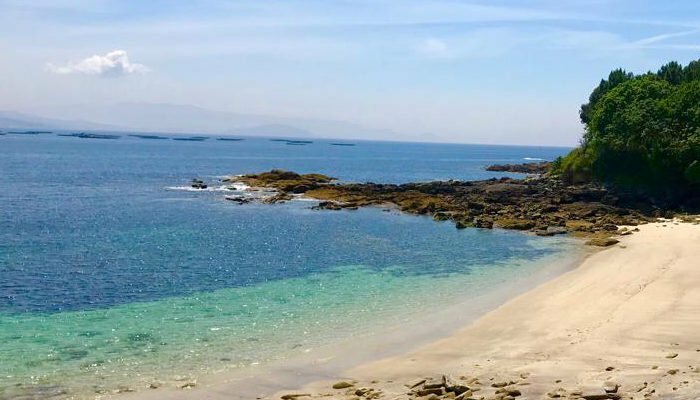 The beaches of the Cíes Islands are nine; the main ones are Rodas, Figueiras and San Martiño, which are the best-known and largest, but if you want to escaparte from the busiest beaches , there are also a series of coves such as Nosa Señora de Carracido, Margaridas, Muxieiro, Bolos or Areíña that are beautiful and wild, in which you can feel in a more intense way the nature of the island. Classified as “the best beach in the world” by The Guardian newspaper in 2007, located between the islands of Monteagudo and the Middle. It is the largest beach in the Cíes Islands. The shell-shaped beach is a wonder, being able to enjoy the views of the Ria de Vigo on one side and the Lagoa de Cíes on the other. This natural lagoon, also called Lagoa dos Nenos, renews itself of water in each tide, and is full of crustaceans, octopuses and fish. This is a beach of fine white sand, which is quite apart, you breathe a different tranquility. On this beach you can practice nudism. It can only be accessed by private boat, so it has an area set aside for anchoring. It is located on the island of Faro, just in front of the island of San Martiño. It is perfect for snorkeling as it is full of marine life and its waters are very calm and transparent. It is located on the island of Monteagudo. An ideal choice if you are looking for tranquility and escape from the busiest beaches of people. Also located on the island of Monteagudo, is a beach with boulders very nice and different from the others. It is a beach accessible only by private boat with an area set aside for the anchoring of boats. It is in the South Island and is one of the most beautiful, with an incredible sand and a turquoise blue in its incomparable waters. If you are a lover of active tourism and you are not satisfied with just enjoying the beach, a highly recommended alternative is to do some of the hiking routes that are along the island. There are four determined and marked routes so that you can enjoy the different landscapes of the island and climb to the viewpoints, which will not leave you indifferent. It’s the best known route and that most people do because of the views and landscapes it runs. 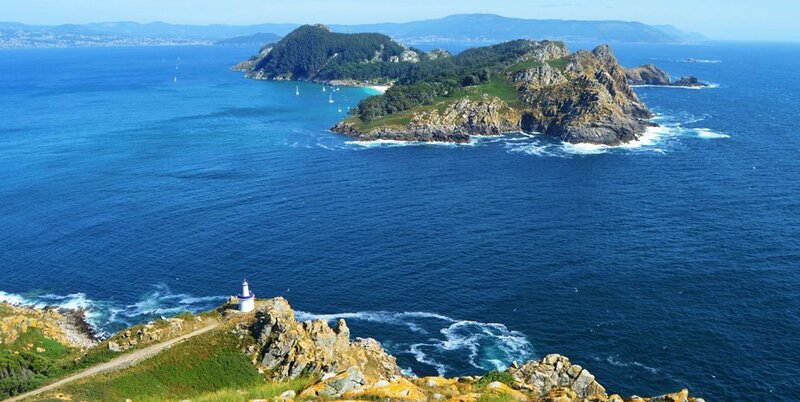 This is a route of 7.5km that begins at the beach of Rodas to end up at the lighthouse of Cíes, contemplating panoramic views of the entire island with the estuary of Vigo and the Atlantic as a backdrop. Its approximate duration is 2.5 hours. This route goes to the opposite side of the previous one, to Monteagudo Island, and goes up to Alto del Principe, where you can enjoy another view of the island, with incredible panoramic views. This route is much shorter, 3.5km, compared to Monte Faro, with an approximate duration of 1 hour and 20 minutes. This route goes along the south coast of the Lighthouse Island. You can admire the best views of this island up to the Faro da Porta, where the beach of San Martiño is the protagonist. It has a length of 5.2 km and lasts approximately 1 hour 45 mins. This route climbs to the top of Monteagudo, in that area, which is the closest to the coast, you can enjoy the views of Cape Home, as well as the rest of the island. It has an extension of 5.6km and an approximate duration of 1 hour and 45 mins. 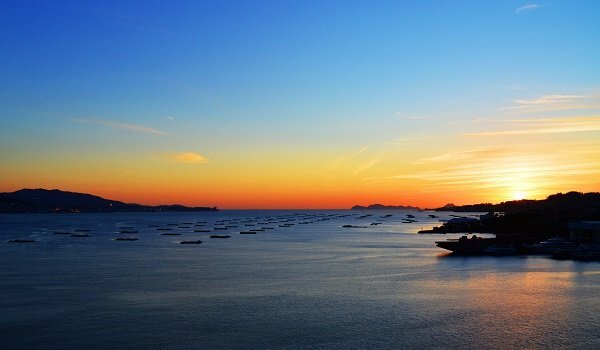 The natural park presents an enormous submerged heritage, as it is an area of shelter in the maritime trade routes that took place throughout history. In fact, you can even admire Phoenician anchorages. In addition to this heritage that we comment on, the fauna and flora that we can find is impressive. Therefore, one of the most practiced sports is scuba diving. It is necessary to ask for a special permit for the practice of this activity. DID YOU RUN OUT OF TICKETS? DISCOVER ANOTHER WAY TO VISIT THE CÍES ISLANDS. Finally, we leave you another way to visit the Cíes Islands: through a private trip . 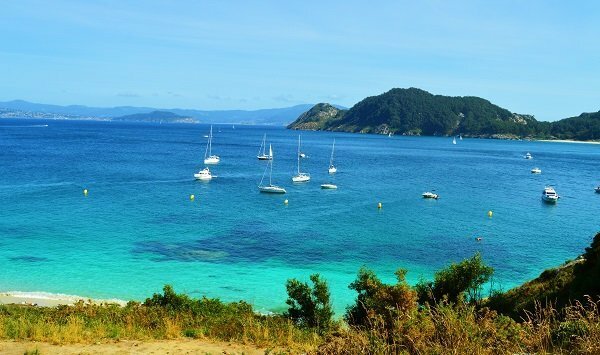 There are companies in the area that offer you an exit to the Cíes Islands to know all their beaches, (even the most inaccessible and you can only go with a private boat ). 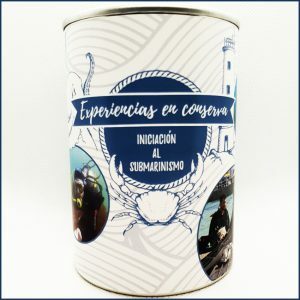 Normally they carry out visits to measure for maximum groups of 8 people, including also all the necessary equipment for the accomplishment of snorkel in the zones with more fauna and marine flora, and always guided by a qualified instructor. They include neoprene suits, mask, fins, socks, and tube so that at no time is the water temperature an impediment. 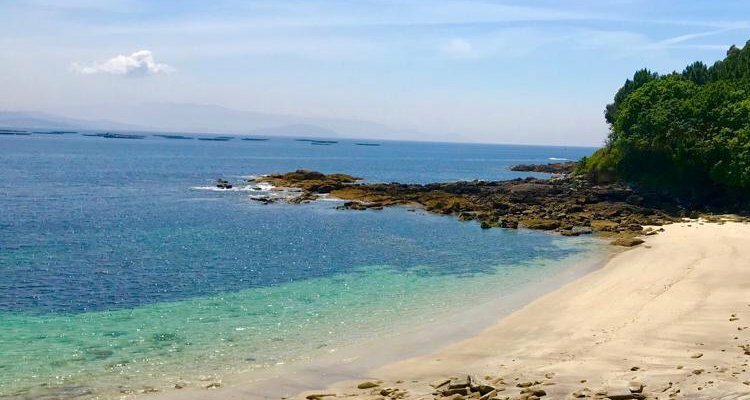 If you would like more information about a tailor-made getaway to the Cíes Islands, contact companies in the area, such as Buceo Rías Baixas. It is not allowed to walk off the trails signposted. There are no garbage bins on the island, so you will need a bag to dispose of your waste that you will have to take back to the peninsula. Is prohibited to take anything from the islands, by anything we mean from rocks to flowers passing by the beach sand, shells or whatever you find along the way. Is forbidden to light no type of fire. Está prohibited to introduce animals, except guide dogs. Is forbidden to feed or disturb animals … so, in addition to protecting your food, you are complying with park rules by not letting the seagulls take it away.